OLYMPIA – Washington taxpayers face a bill of some $2.4 billion to repair hundreds of culverts over the next 11 years as a result of a U.S. Supreme Court decision Monday. Divided 4-4 with Justice Anthony Kennedy not participating, the tie lets stand a decision by the 9th U.S. Circuit Court of Appeals that the state was violating a series of tribal treaties with culverts that block salmon coming from and going to spawning grounds. Gov. Jay Inslee said the ruling brings “finality” to the long-running battle, and hopes various groups can work together to restore salmon habitat. Attorney General Bob Ferguson said the decision places a financial burden on Washington taxpayers, even though the federal government and other groups have culverts upstream or downstream from the state structures but aren’t required to fix them. “It’s also time for others to step up in order to make this a positive, meaningful ruling for salmon,” Ferguson said in a news release. The federal government sued the state over dwindling salmon on behalf of tribes in 1970, and in 1974 received a ruling that the state was violating its obligations that date back to treaties signed in 1854-55 between the tribes and the territorial governor. The trial court kept jurisdiction over the case, and in 2013 said part of that violation was failing to maintain or replace culverts that block access to spawning grounds in streams flowing into the Puget Sound, or out of the Olympic Peninsula into the Pacific. 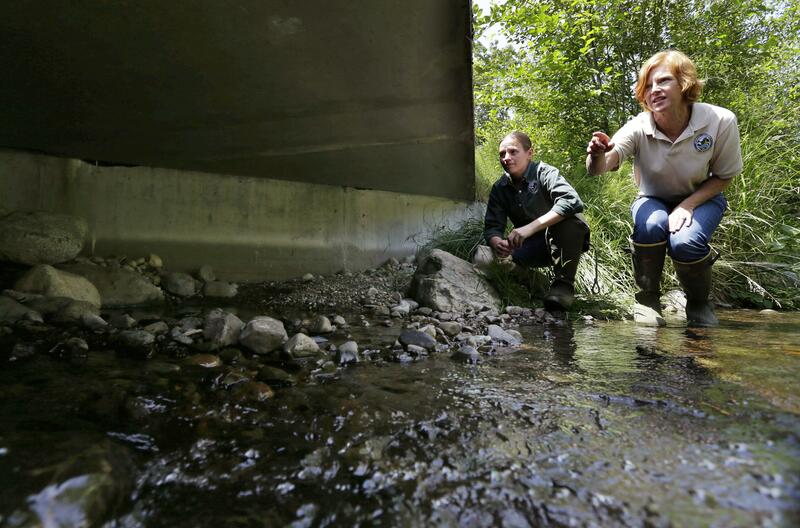 It gave the state until 2030 to replace 90 percent of the problem culverts on state lands. The largest share of those state culverts, more than 500, are on property connected to roads, highways or bridges under control of the Washington Department of Transportation. Paul Wagner, branch manager of the department’s Environmental Service Office, said the department has fixed 55 culverts and has the money to fix another eight by June 30, 2019, the end of the current fiscal biennium. Total cost so far is about $200 million. Estimates to fix or replace approximately 425 culverts, which would bring the state into compliance, is about $2.4 billion, Wagner said. To meet the 2030 deadline “we’re going to need to have more funding from the Legislature,” he said. The culverts usually span 12 feet or less, are made of steel or concrete, and most are designed to meet federal standards because they are connected to projects that receive federal money. Many state culverts have others built and maintained by federal, county or city agencies, or private land owners between them and spawning grounds or the mouths of rivers leading the ocean, he said. The state asked the appeals court for an order that would have required the federal government to fix its culverts which also block access before Washington is required to fix its culverts. The appeals court refused, saying the federal government has “sovereign immunity,” which means the state can’t force it to take such action and the right to demand action on behalf of salmon belongs to the tribes under the treaty, not to the state. Public Lands Commissioner Hilary Franz called the court’s decision fair and just because it affirms a collective responsibility on the survival of Pacific salmon. “The time is now to think boldly about how we move forward on many fronts, including culverts,” she said in a news release. A spokesman for the Department of Natural Resources, which Franz oversees, said that agency has removed or replaced about 385 culverts in the last decade. “We’re nearly in compliance already,” Carlo Davis said.